The Kroonenberg Group is committed to supplying added value to the quality of shopping, working and living, combining shopping and working with attractive surroundings, good accessibility and high-level services. Kroonenberg Group projects are situated in prime city-centre locations. diz was commissioned by the Kroonenberg Group to place a third wayfinder in the De Barones shopping mall in Breda. The name “wayfinder” says it all: visitors to the mall can use this digital solution to find their way to the right location in the complex. 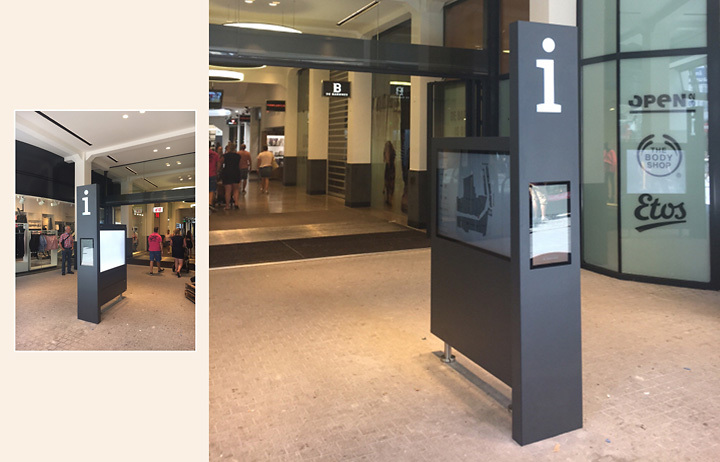 It is an information point for the visitors: the wayfinder’s screen displays a floor plan of the stores and facilities located in and around the mall. Breda was recently voted the “Best City Centre in the Netherlands”. A day’s shopping in Breda begins at De Barones. You can endlessly shop in comfort in this fully renovated indoor mall in the historic heart of Breda.